Desserts have evolved so much in the past years. We’ve seen the cupcake wave, pies and now I feel that we appreciate a smaller indulgence. Something that we can call our own. A little bite of sweetness that can transport us to heaven and slowly bring us back to Earth (and reality). Bite-size desserts can do just that. Of course, as it is my case, I don’t stop at one bite. I can take two or three if it’s super yummy. But again, who’s counting? Certainly not me. 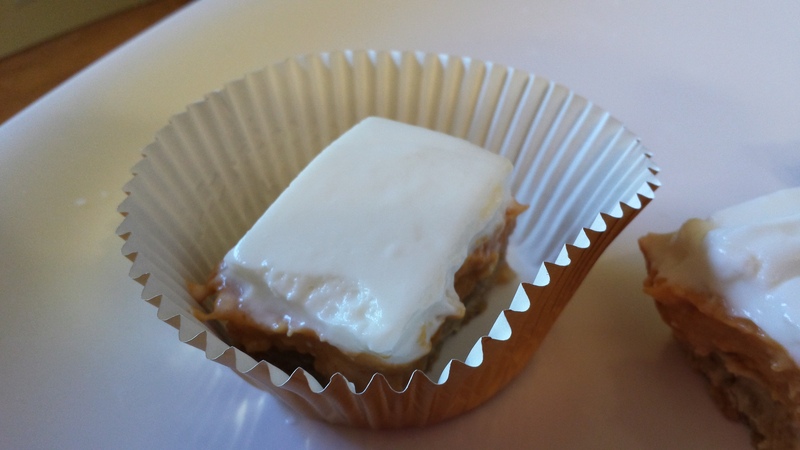 So I have started experimenting with cheesecake bars. You probably remember the Cookies and Cream Cheesecake Bars on a previous post. 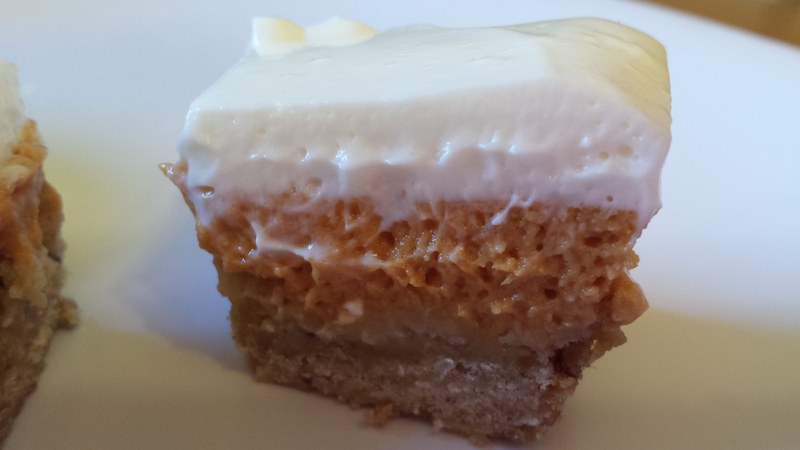 With the holidays upon us, it is time to try a Pumpkin Cheesecake Bars recipe. 1-Heat oven to 350 degrees Fahrenheit. Spray 13×9-inch pan with cooking spray. 2-In medium bowl, mix flour and brown sugar. Using pastry blender, cut in butter until mixture looks like coarse crumbs. 3-Stir in oats and walnuts. Press in bottom of pan and bake for 15 minutes. 4-In large bowl, beat filling ingredients with electric mixer on medium speed until well blended. Pour over hot base. Bake 20-25 minutes or until set and dry in center. 5-in small bowl, mix topping ingredients. 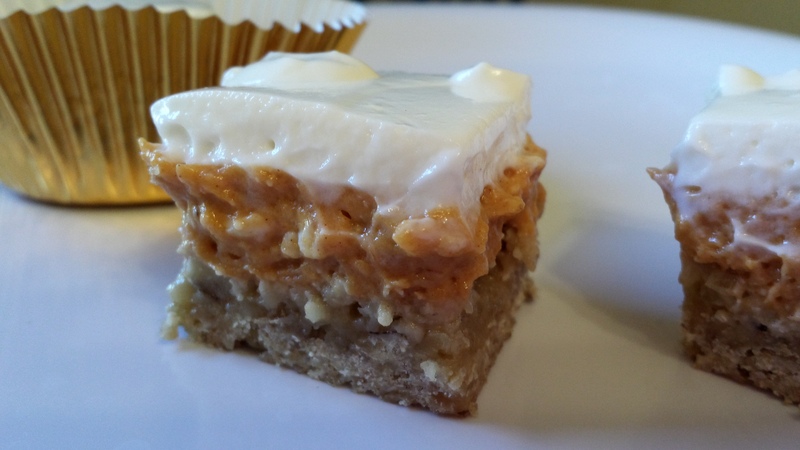 Drop mixture by spoonfuls over pumpkin layer (spread evenly over hot filling). Bake about 5 minutes or until topping is set. Cool completely, about 2 hours. 6-Store covered in the refrigerator. Cut into square when ready to serve. They were exceptional! Definitely worth making a batch. Just be careful because you might eat it all by yourself.